The Summer Olympics in Rio de Janeiro, the first South American city to host the modern games, famously faced challenges in the run-up to the event – from construction delays to a polluted venue to worries about the Zika virus and urban crime – many of which have been overcome. But there’s a question that always comes up for Olympic cities after the torch is extinguished: was it worth for its residents? In Rio’s case, as for previous Olympic host cities, the long-term benefit may be in doubt, but is definitely yes when it comes to public transport. 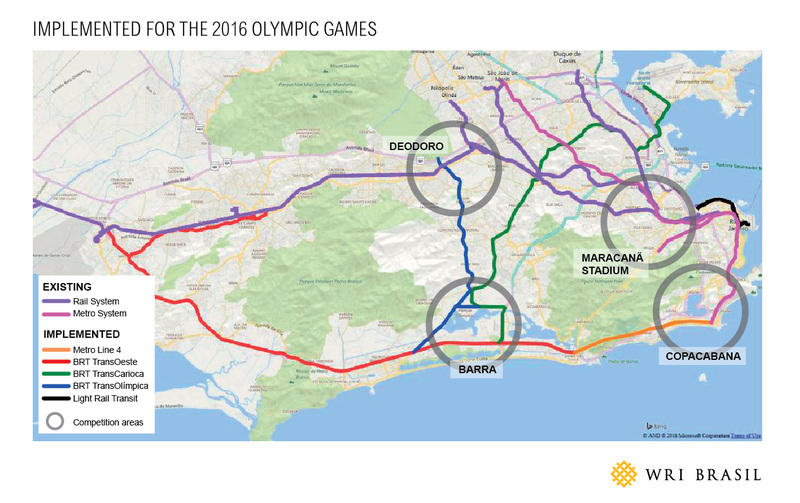 In advance of the games, the length of mass transit systems in Rio, mostly Bus Rapid Transit (BRT) were more than double what had been promised for the Olympics, from 76 to 156 kilometers (47 to 97 miles). The downtown Light Rail System (LRT) was not part of the Olympic transit promise, while metro extension increased from 4 to 16 km (2.5 to 10 miles). These improvements set the groundwork for a world-class mass transit system for Rio, but it depends on strong follow-up. The next city administration, which takes office in January 2017, needs to secure financing to finish the TransBrasil BRT corridor. 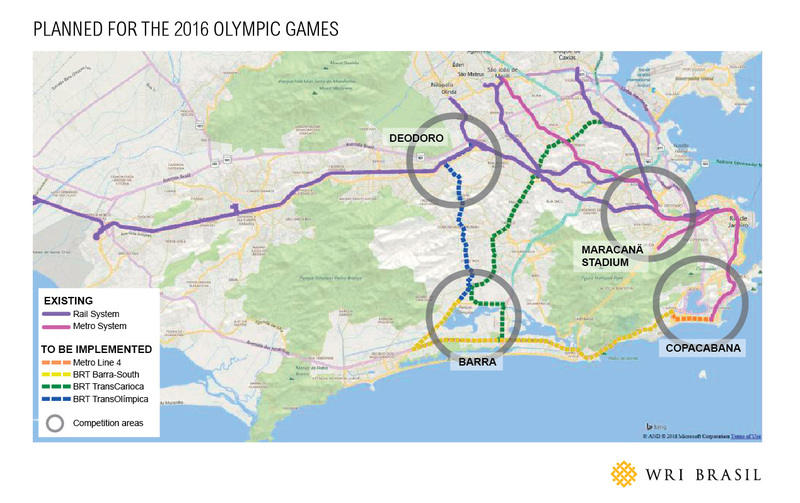 If service reserved for Olympic ticket holders is transferred to city residents after the games, as expected, and the TransBrasil line is completed, the number of daily mass transit trips will increase substantially. According to city forecasts, the share of daily trips made by mass transit – BRT, metro, train — is likely to increase from 18 percent to 63 percent of all daily trips. How did that happen? Rio has learned from experience. Before being selected to host the 2016 Olympics, Rio de Janeiro failed in two previous attempts, in 2004 and 2012. Both times, transport plans relied heavily on implementing metro rail lines and motorways. The history of difficulties in financing rail construction cast doubt on whether transport would be in place on time. Hosting mega-events has been part of the Rio’s strategy since the 1992 Earth Summit. For the 2007 Pan American Games, two new metro lines and a light rail transit system connecting the international and domestic airports to the west zone of the city were promised, but never implemented. In its third, successful attempt to host the Olympic Games, Rio knew the city needed a realistic and coherent proposal. The focus of its transit strategy changed from rail to bus, featuring innovative BRT corridors. The backbone of the transport plan included a high-performance bus based transit network integrated with existing boat and rail systems. And beyond getting cars off the road and moving visitors, athletes and locals where they need to go, the new BRT system would also reduce greenhouse gas emissions by using a more fuel-efficient fleet. 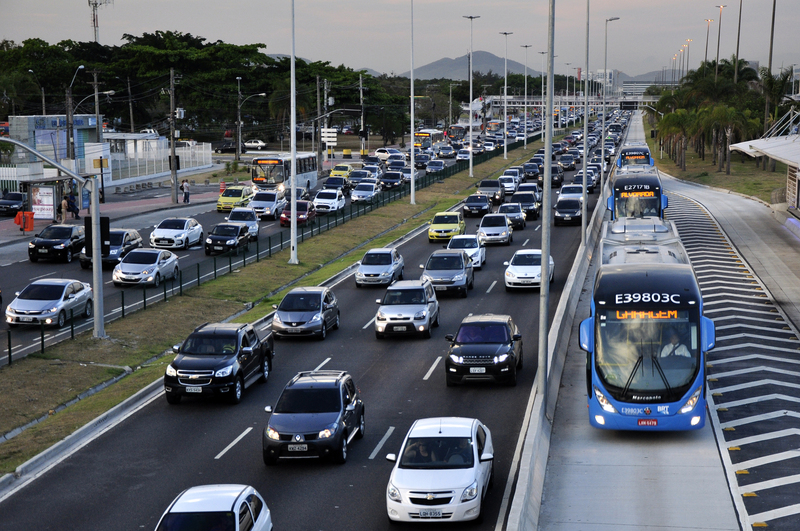 When evaluating Rio’s proposal, the International Olympic Committee requested extensive studies to estimate the capability of TransCarioca BRT to handle the extra demand. 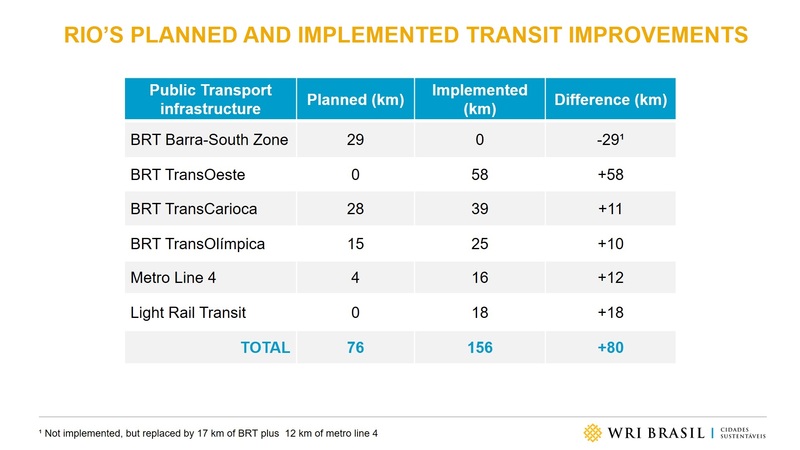 WRI Brasil Sustainable Cities proved that BRT would not only suffice but also provide better value. Relatively minor changes in station layout and mix of services made it possible to achieve significant gains in system capacity and performance. There is already evidence that BRT has had a positive impact in Rio. Rider surveys have shown encouraging results: nine of every 10 respondents said the cost of travel had decreased or stayed the same with BRT compared to other means of transport, while two-thirds had a favorable impression of the connected bus network. The survey showed that for the regular commuters who are the system’s primary users, travel time has been cut by about 35 percent. This type of feedback will continue to inform recommendations to improve the BRT network. There are pending challenges for when the Games are over, like fully integrating all public transport modes and finishing the implementation of the BRT network. But the Olympics offered Rio the possibility of having a public transport network that is capable of shaping its future urban development, making it a more compact, connected and coordinated city. Rio has the potential to become a flagship for reliable and sustainable mobility, inspiring other cities in Latin America. That would truly be an Olympic legacy.